1. The width between 2 adjacent posts. Our installation guide gives clear instructions that show what this dimension is and how to measure it. With this information Omega will manufacture the In-Fill section components that will allow a straightforward installation that is made-to-measure. The price assumes a standard installation using a standard 2.5m supporting post length. The price is for (1) Bay i.e. an in-fill section between (2) posts. There are (2) glazed panels in this in-fill section. 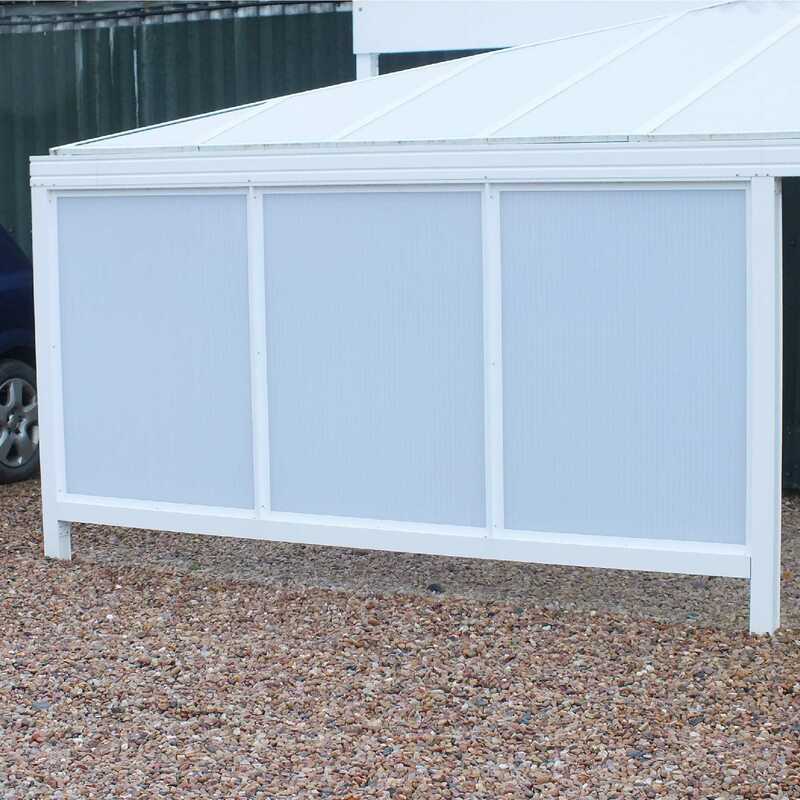 The In-Fill section frame is supplied in White, powder-coated aluminium. The glazing panel is supplied in 16mm Clear, Bronze or Opal Polycarbonate. If you require the In-Fill section frames in a colour other than White please contact Omega for a quotation. I would recommend your affordable products (Omega Smart Canopy Accessories | Glazed In-Fill Sections for Omega Smart Canopy | Omega Smart Canopy - UNDER EAVES In-Fill Sections (2 In-Fill Panels) for 2.1m, 3.5m, 4.2m, 6.3m Width Canopies, 16mm Polycarbonate In-Fill Panels, White Frame) to anyone else considering this product, as it has been superb. Omega Build Shop | Omega Smart Canopy Accessories | Glazed In-Fill Sections for Omega Smart Canopy | Omega Smart Canopy - UNDER EAVES In-Fill Sections (2 In-Fill Panels) for 2.1m, 3.5m, 4.2m, 6.3m Width Canopies, 16mm Polycarbonate In-Fill Panels, White Frame. You are viewing Omega Smart Canopy Accessories | Glazed In-Fill Sections for Omega Smart Canopy | Omega Smart Canopy - UNDER EAVES In-Fill Sections (2 In-Fill Panels) for 2.1m, 3.5m, 4.2m, 6.3m Width Canopies, 16mm Polycarbonate In-Fill Panels, White Frame, buy online today!